As usual, the most popular game is to fit the signal into every possible model, including those that firmly resist. There's been some interesting developments on this front, but I'll keep that for another post. For now, I'll restrict to the properties of the signal and astrophysical constraints. The statistical significance of the line is large, the precise number depending on how the data are cut and cooked. In the original paper the significance was 4.6σ (before taking into account the trial factor), but for example in this paper the numbers 5.0σ or even 5.5σ are bandied around. That paper also claims that a slightly better fit to the data is with 2 lines, one at 129 GeV and another at 111 GeV, and that the center of the emission is off by 1.5 degree from the galactic centre. The former may be a good news for dark matter, as most models predict 2 separate lines, from annihilation into γγ and into γZ. The latter doesn't have to be a bad news, in view of the recent simulations of dark matter distribution. Two groups were recently scanning the Fermi data for suspicious features that could suggest hat the line is an instrumental artifact. They may have found one: a 130 GeV line in the Earth limb sample. Cosmic rays hitting the atmosphere produce gamma-rays that sometimes fall into Fermi's field of view. This provides a sort of calibration sample where no signal is expected. Instead, there seems to be a 3σ line in the Earth limb photons that can be made even more prominent with specific cuts on the photon incidence angle. Is that an unlucky fluctuation? On the other hand, it's difficult to imagine an instrumental effects or a software bug that could be responsible for both the galactic center and the Earth limb lines. There are 2 more places in the sky where the presence of the 130 GeV line was claimed. The line was observed in the nearby galaxy clusters, which may be a good news. Also, the line was observed in the unassociated gamma-ray sources, which is probably a bad news given those were later claimed to be AGNs. No line was detected from the dwarf satellite galaxies of the Milky Way, which is probably not a problem, and no line emission was found in the galactic plane, which is good. In most models of dark matter a gamma-ray line would be accompanied by a 1000 times more intense continuum photon signal, just because dark matter annihilation into other final states (that later emit photons) would be dominant. However, the observed photon spectrum from the galactic center - the same one that displays the monochromatic signal - puts very strong constraints on the continuum emission. Typically, the cross section for dark matter annihilation into other final states can be at most 10 times larger than the cross section for the annihilation into 2 photons. 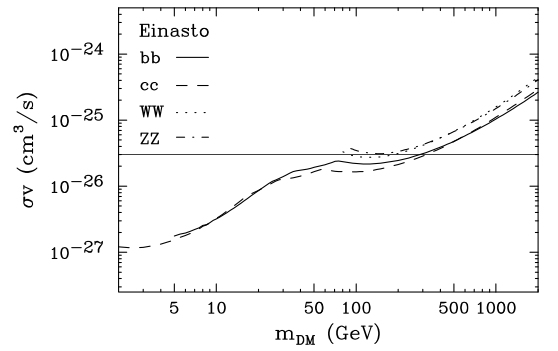 For example, this paper claims the limits on the annihilation rate of 130 GeV dark matter into most final states is comparable to the thermal cross section 3*10^-26 cm^3/sec (the one that guarantees the correct relic abundance if dark matter is of thermal origin), and even stronger with less conservative assumptions about the dark matter density profile. This is a severe constraint on theory, such that the models explaining the Fermi line have to be tailor-made to satisfy it. 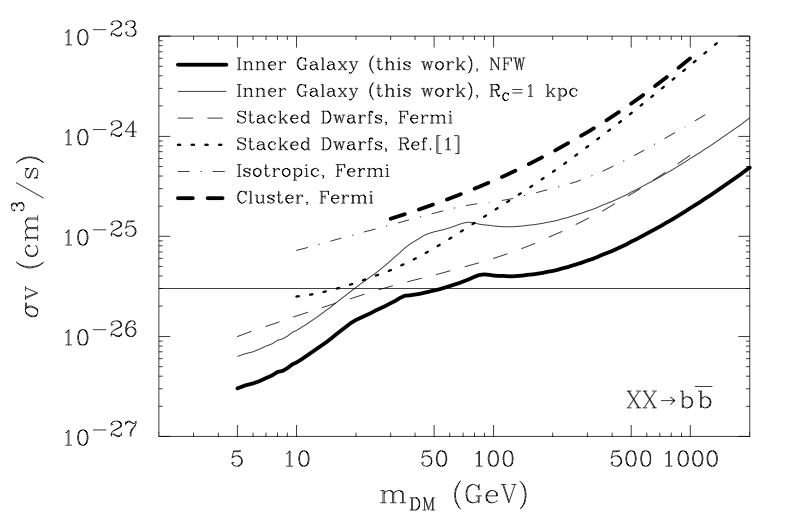 In summary, there are 2 main arguments against the Fermi line being a signal of dark matter. One is the presence of the line in the Earth limb photon sample. The other is that it's good to be true. Based on that, it's probably worth staying excited for a little longer, until there are better reasons to stop the fun.